We had helped this client in the past, so they asked us for help with their new project. They were developing a new RADAR system and had selected most of the parts for their system, but the variety of Connectors and Signal voltages meant that they could not simply plug them together. Working with the client to make a block diagram, we helped to define how the components needed to be connected together. Some of the connections needed to have electrical isolation, so we took care of designing that for them. Some of the cabling would pass between units of the system and would be connected in the field, so we recommended some Electro Static Discharge (ESD) protection on those lines. Looking at the Signal Integrity of the system, one of the cables carried a large number of high speed signals, but the supplier of that equipment didn't provide many dedicated GND connections. We recommended that some signals were programmed to be driven permanently low by the FPGA in that equipment and connected those lines to GND on our board. This increased the number of low impedance return paths for the signal return currents, helping to improve the signal quality and to reduce crosstalk. We also recommended some series termination resistors in some of the other signals so that we could help to match the unknown impedance of the cabling. We provided Schematic capture of the design and then a custom PCB design for them. It offers all the the connector types to match the other items, and requires only the power supply voltages that were already available in their system. We helped to get the mechanical design right to allow the board to be mounted in their system and offer easy access for maintenance. Despite the simplicity of the electronics, our expertise helped them to get their system working quickly and reliably. We produced a small number of prototypes for them using our vapour phase equipment, using them to get the systems working and to develop production test software for the RADAR interface board. 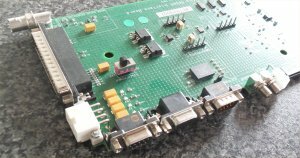 When they were ready, we produced the production boards for them at a fixed price including full functional test and warranty.